"The most beautiful thing we can ever experience is the mysterious - It is the source of all true art and science." CELTIC FADO â€“ SYMBOLIC OF THE ‘WONDER OF BIRTH’ is the bardic fadisto passing on their version of ‘true’ history through their songs. In the Ancient Gaelic language, Fado literally means ‘songs of long ago.’ Modern Fadisto singing Fado in this new millennia have a larger role than ever before in history, they must inspire the people of the world to work together to bring about the change. From the time known as Pisces (our previous 2,160-years) to now, this time of our future on earth, known as Aquarius â€“ the time for new awareness wisdom. What is seriously important for all songwriters’ lyrics being written for today and tomorrows fado, we must study the pre-history of Antediluvian Celtic Culture. We must learn from our mistakes of yesteryear, so as not to repeat them again today, or create any distortion of what is happening worldwide, now and in the immediate and distant future. CELTIC FADO, in the modern world it is not uncommon for Fadisto to sing their songs of Fado as songs of Destiny, although not necessarily wrong, as it is not wrong to have such a word open to interpretation. But, according to the Gaelic dictionary Fado has one meaning, and that is ‘long ago’. When anyone sings Fado with a true heart, in today’s entertainment market they will become a ‘FAD’ (an abbreviation of Fado) ‘a new fad’ unknowingly, a common Gaelic expression in many countries. And as a fad, they will enjoy being extremely popular. When one has achieved this acclaim from Fado, one must remain diligent in bringing forth the Truth, this way you are sharing with the source, and all Fad status will be maintained. If not, if you deviate from any of the Truths, your notoriety will surely suffer the duality of ‘Fado’ and ‘Fade’, quickly and simply - disappear. 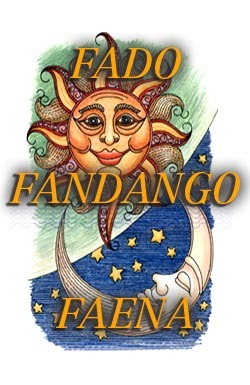 CELTIC FADO, what is not only WRONG, but is a part of the crime against all Celtic Consciousness is that some of the oldest countries around the globe are ignorant of their own Celtic blissfulness. Take Portugal for example, the academics there think Portuguese Fado is less than 200- years old. And even worse, they think it came to Portugal from Brazil, with origins in Africa. One would think that Portuguese with their thousands of years of Celtic Culture, prior to being named Portugal by ‘the powers to be’ in relatively modern times (in fact, only eight hundred years ago), would be more aware of their Lusitanian Celtic cultural heritage. The word Lusitanian is Gaelic, Fado is Gaelic, and either one is more than likely, as old as the other. During December 2004 our company, Celtimania Productions was negotiating to start a Television Series in Portugal. During our research stage we had phoned and spoke to a Marketing Director of The Lisboan ‘Museum for Fado’. She was promoting a new book release, penned by its author from Brazil stating that’s where Fado came from? Less than 200 years ago? With its origins dating back to Africa? This same Marketing Director was using this book for the sixth annual acknowledgement of the death of Portugals most famous Fadisto singer. Amalia Rodrigues with her extra extraordinary singing, had helped sustain her compatriots through decades of the fascistic Salazar dictatorship. We endeavoured to explain to this Marketing Director that due to this fascism, Amalia was restricted to singing only hygienic Government accredited Fado, totally edited and controlled by that dictatorship. We tried reasoning with this woman wether she thought this word Fado, was either Portuguese, Brazilian, African or perhaps it might even be of Gaelic tradition - totally negative response - nothingâ€¦ we hung up the phone! CELTIC FADO, another of countless examples of this ignorance is my Country Australia, founded as a ‘British colony’ by Celts just two hundred years ago in 1788 AD. (Another part of this cultural crime is that Australians in general are also ignorant of their Celtic lineage). Early convict settlers were given 20 lashes with the cat of nine â€“ tails, enough to rip multiple layers of skin entirely off their backs, for daring to speak in Gaelic, this being their native tongue, and the second most common language spoken in Australia at this time. Those early arrivals did however at some stage communicate with Australia’s Indigenous peoples, the Elders of this truly ancient race (having been on this continent for much more than - perhaps as much as double â€“ the current popular belief of 60,000 years). And from this, these Celts learned of their music Fado being passed on to these aboriginal tribes by these early Portuguese (Lusitanian) Celtic seafarers visiting Australian shores in the sixteenth century (between four and five hundred years ago). ‘Dreamtime’, it was explained is about Aboriginal creation mythology, and for more than 60,000 years this indigenous race have passed down their knowledge of the ages by ‘oral communication only,’ including their ‘songs of long ago’. Their warriors, in preparation for battle, would paint their face and entire bodies with indigenous war-like artwork. They loved nothing better after a ferocious battle than to perform their spiritual ‘Corroboree’ (dance of appreciation to their Gods), their sacred lore stated that this must occur down by the ‘Billabong’ (the waters edge), and after having crucified a ‘Kangaroo’ (never tied to a tree â€“ this battle for survival was truly man against beast â€“ and man occasionally lost) for a feast around the fire these warriors loved bragging of their exploits during the winning of the battle, both against their ‘very brave’ opposing tribe and of course, the kangaroo, for their on going battle with nature for their own survival.